My research in the past few years demonstrates the potential of the entomopathogenic fungus, Beauveria bassiana in managing various arthropod pests on broccoli, lettuce, and strawberries. Substituting, combining, or rotating this friendly fungus with chemical pesticides can be a good choice for sustainable pest management. However, several fungicides are routinely applied for managing diseases such as powdery mildew andbotrytis fruit rot in strawberries and other diseases in vegetable crops. This creates a potential conflict between the friendly fungus and fungicides targeted towards harmful fungi. 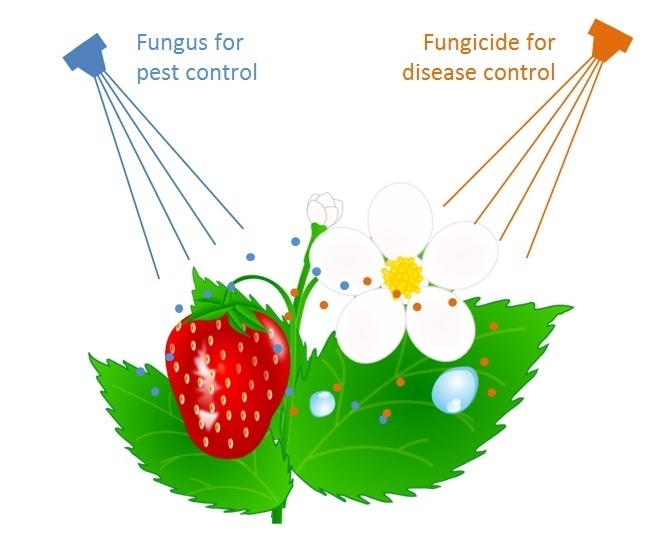 When insect pathogenic fungus biopesticides are used in a cropping system where fungicides are applied for controlling plant diseases, there can be incompatibility between fungi such as Beauveria bassiana and some fungicides. To address the compatibility issue, I have conducted several laboratory assays with B. bassiana and some fungicides commonly used in strawberries. Fungicides, captan (Captan 80 WDG), fenhexamid (Elevate 50 WDG), sulphur (Microthiol Dipress), pyraclostrobin + boscalid (Pristine), quinoxyfen (Quintec), myclobutanil (Rally 40 WSP), and cyprodinil + fludioxonil (Switch 62.5 WG) were evaluated in this study. Mealworms (Tenebrio molitor) were used as bait insects to measure the infection by B. bassiana (Mycotrol-O) with and without the fungicides. Each treatment had 40 mealworms. Mealworms were exposed to B. bassiana (positive control) or B. bassiana + fungicide for 24 hours and then individually incubated with food material. Mortality was monitored for 7 days. Dead mealworms were surface sterilized and incubated on artificial medium. Emergence of B. bassiana from the dead mealworms indicates infection. Untreated worms were used as negative control. Assay was repeated six times. Data were analyzed using statistical procedures and significant means were separated using Tukey's HSD test. On average B. bassiana caused 96% mortality in mealworms and 90% of them showed symptoms of infection. 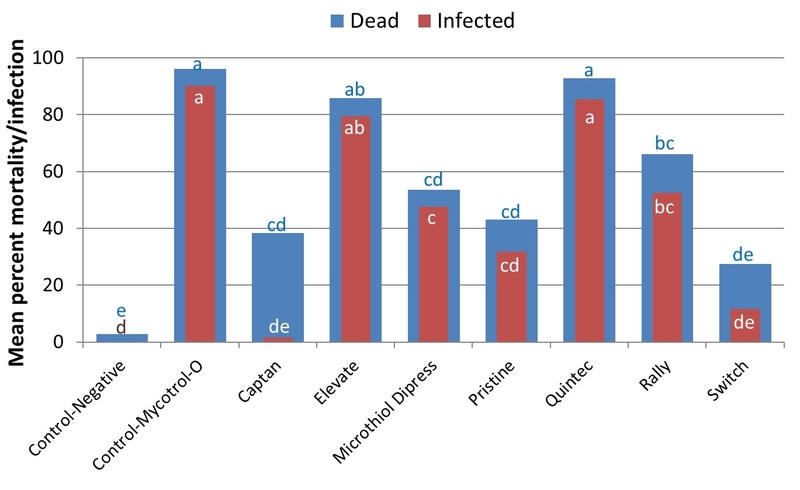 When B. bassiana was applied along with fungicides, Elevate and Quintec showed the highest compatibility with 86% and 93% mortality in mealworms, respectively. Microthiol Dipress and Rally were moderately compatible and Captan, Pristine, and Switch were least compatible. Not all dead insects show infection all the time and this can be seen with lower proportion of infected mealworms compared to total mortality. However, nearly 37% of dead mealworms did not show the symptoms of B. bassiana infection in the presence of Captan. Mortality and infection in mealworms exposed to B. bassiana alone or in combination with various fungicides. Elevate and Quintec are very compatible and can be used when B. bassiana is applied for pest management. Increasing the time interval between B. bassiana and incompatible fungicides could improve their compatibility and accommodate microbial control in IPM. Additional studies to address this issue are planned, but a preliminary assay was conducted by applying B. bassiana simultaneously and 1 and 4 days after applying Pristine. 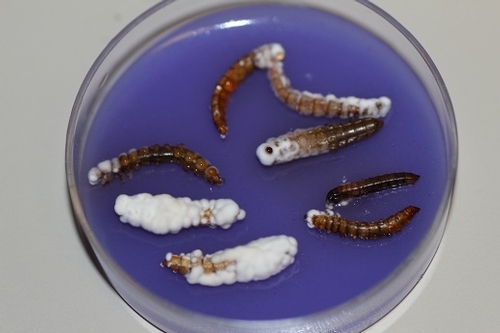 Mortality and infection of mealworms was observed for untreated control, B. bassiana alone, and B. bassiana and Pristine applied at three intervals. All the dead mealworms showed infection in this assay. 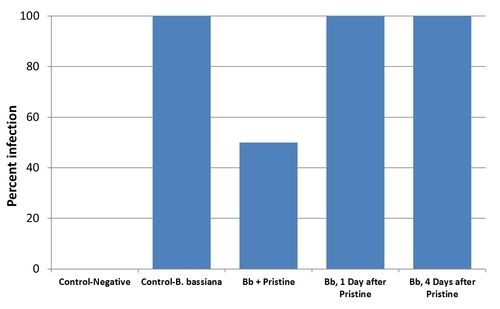 When B. bassiana was applied along with Pristine, only 50% of the mealworms died. However, the compatibility between B. bassiana and Pristine significantly improved with one day interval. One day time interval between the fungicide, Pristine and B. bassiana eliminated the incompatibility issue in a preliminary assay. Additional assays with Pristine and other incompatible fungicides will be conducted, but these results show promise for microbial control and address some critical questions related to entomopathogenic fungus and fungicide compatibility. Part of this study was conducted as a middle school Science Fair project.